Littelfuse Leaded Resistance Temperature Detectors (RTDs) exhibit a nearly linear temperature-resistance curve as well as high accuracy over a very wide temperature range. Their -50°C to +500°C typical operating temperature range along with their low thermal mass, high vibration and thermal shock resistance makes them especially suitable for use in extreme environmental conditions. 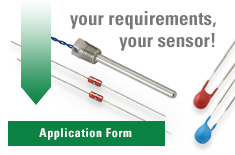 Littelfuse offers a broad range of thermistors, RTDs, probes and assemblies for demanding temperature sensing applications worldwide. Recognized for their accuracy and long-term reliability, Littelfuse thermistors and RTDs are the sensor of choice for diverse markets such as Industrial Controls, Medical Electronics, HVAC-R, Aerospace, White Goods and Food Handling.